Microsoft Outlook is a personal information manager typically used in the workplace. As a well-known Email client, it also manages contacts, calendars and your daily tasks. For those who have switch from Windows phone to new Android phone, the first problem concerned is how to copy contacts from Windows phone to the new Android phone. If you were thinking to transfer contacts by the help of SIM card (type one by one), it would drive you crazy! The most advisable way is to synchronize Microsoft Outlook contacts to Android phone or by using a professional tool like Android Assistant. Today I will show you two simple solutions that you can use to transfer your contacts from Outlook to Android. Microsoft has enabled EAS (Exchange ActiveSync) on all Outlook accounts, which means we can now synchronize emails, contacts, and calendar on all email clients compatible with EAS 2010 WebDav. So you need to download and install Outlook or other Email clients that supports Outlook account. 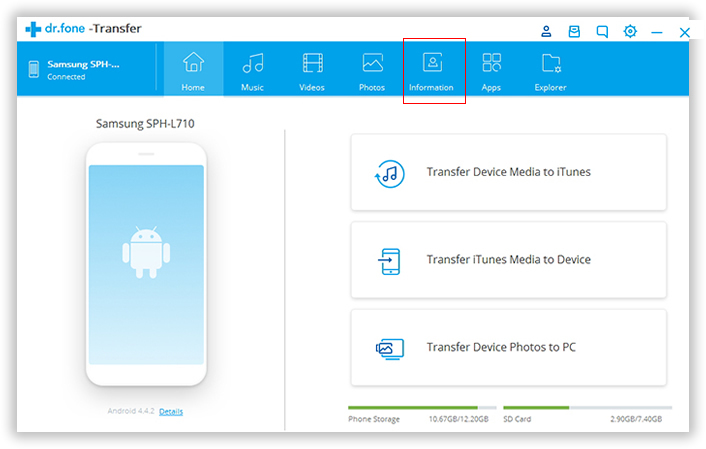 Here I will explain the step-by-step guide on how to transfer Outlook contacts to Android phone. Step 1: Open Outlook Email client on Android phone and select "Add Account". Enter your Outlook email address and your password as well. Step 2: Select "Manual Setup" and when asked what type of account is this, choose "Exchange". Step 3: If the device asks for "domain", you should leave it blank and if the device asks for "User Name", please enter your full Outlook Email address. Step 4: Input m.hotmail.com for the server name. Make sure the box "Use secure connection (SSL)" is enabled. If not, activate it. Step 5: Go next and select the options you want for the frequency of checking the inbox as well as the number of days for synchronization. Then go next and set color/account name (e.g. "Outlook"). Android Assistant, as it name tells, is a Android device manager designed for Android phone users. It can transfer several types of content from computer to Android in a secure and fast way. The content includes contacts, text messages, photos, music, videos, files and apps. If you were switching from Windows phone to Android and want to transfer Outlook contacts, then Android Assistant is the best option available for now. Step 1: Download and install Android Assistant on a PC or Mac. Open the program when installation is completed. The main user of this program is like this. Step 2: Connect your Android phone to the computer via USB cable. And click "Contacts" from left sidebar. Click " Import" -> " Import contacts from computer " -> " from Outlook 2003/2007/2010/2013". 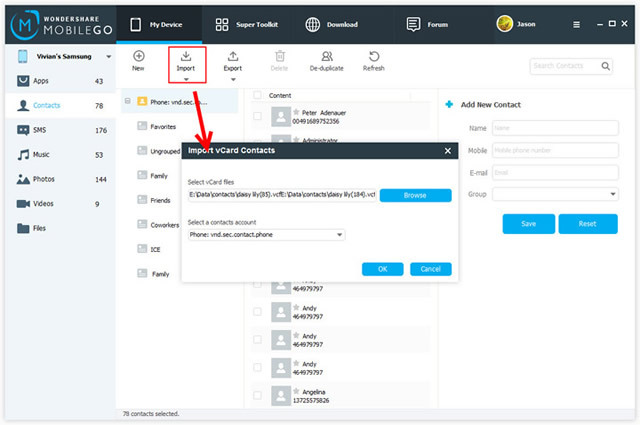 Then select an Outlook account to import contacts. 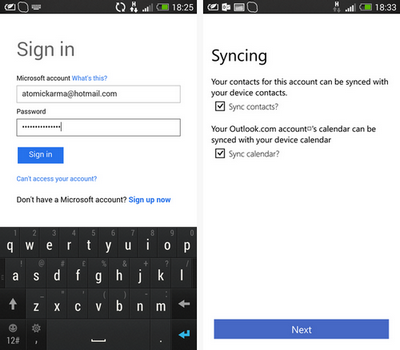 Step 3: A few minutes later, all the contacts in Outlook account will be transferred to your Android phone. P.S. If you have backed up your Windows phone with OneDrive, then open the program and select "Restore from Backup". Choose OneDrive from the drop-down list and sign in with Outlook account. The program will download and extract the backup file. After this, choose the data you want to transfer and all the selected data will be copied to Android in a few minutes.